Feith’s horse-opera-like script will be familiar to all who read this book, and it should have had a happy ending except for the fact that Feith, like all neoconservatives, lives in a parallel universe where he defines reality and only his ideas are valid, pure, and good for America. As a result, and despite 528 pages of text, Feith unwittingly explains how he and Rumsfeld’s team brought America unmitigated disasters in Afghanistan and Iraq. He also shows how delusional the Bush administration is in its day-to-day modus operandi; to paraphrase a Celtic warrior’s words about the Romans, the Bush administration creates catastrophes for America and calls them successes. Nowhere is this more obvious than in Feith’s Hitlerian big lie about the total success the Bush administration achieved by putting Hamid Karzai in power in Afghanistan [pp. 135, 143, 145, 152, 253, 372, 458]. It is obvious to all with an eye to see that Rumsfeld, Feith, Wolfowitz, George Tenet, Colin Powell, and Condoleezza Rice knew nothing about Afghan history or its ethnic and tribal structure; ignored the lessons of the harrowing military disasters experienced in Afghanistan by Alexander, the British, and the Soviets; picked Karzai as leader, a man who represented no one but himself; sent an amateurishly small military force to fight al-Qaeda and the Taliban; and naively believed that winning the battle of the Afghan cities equaled winning the Afghan war. The current situation in Afghanistan makes it clear that a few more of what Feith described as total successes will defeat the United States. No, Feith says, the central reason America invaded Iraq was because of the “legitimate” fear that somehow, someday, sometime Saddam Hussein just might give a WMD to an unidentified terrorist group that might use it inside the United States. [p. 491-92] Feith gives not the first shred of evidence as to why the administration believed this to be a possibility; he speaks only of the “intense concern that a hostile state, working with a terrorist group, could precipitate a catastrophic attack on us.” [p. xi] Feith’s words smack of nothing so much as a cynical after-the-fact justification for the administration’s deliberate misleading of American on the reasons for war. But whenever this particular casus belli was dreamed-up, it can be quickly and absolutely dismissed. If the Bush administration was the least bit interested in making sure there would not be a nuclear detonation inside the United States, it would have bent every effort to complete the securing of the Former Soviet Union’s nuclear arsenal  a program now underway since 1991  as well as to lock up the substantial amount of fissile material that continues to be less than fully secured at research and power reactors around the world. The Bush administration, however, followed the example of Mr. Clinton’s and cut personnel and funding for the effort. 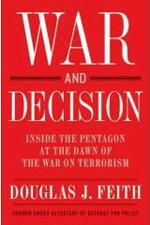 There also is no indication in Feith’s book that the Pentagon made sure that Iraq’s numerous WMD scientists were, first, accounted for, and, second, later kept check on, although Feith says “the existence of WMD programs”  and implicitly the scientists who ran them  “was far more important [in the decision for war] than the question of [WMD] stockpiles.” [p. 225] If the Iraqi WMD scientists have been allowed to wander from the country and find work with other regimes or groups since Iraq fell, Saddam’s biggest contribution to WMD proliferation was made courtesy of the Rumsfeld team. After thus admirably explaining that there was only a theory-based, not a reality-based justification for the Iraq war, Feith then deploys the neoconservatives’ tried-and-true tactic of analysis by assertion, a method of argument that presents glib lies in the place of facts. Here is just a sampling.  “The dead of the Pentagon and the World Trade Center and on Flight 93 had been murdered simply as symbolic U.S. targets.” [p.4] Nonsense. The 9/11 attacks followed al-Qaeda’s 1996 declaration of war against the United States for what it perceived as attacks by U.S. foreign policy on Islam. There was nothing “symbolic” about the attacks; they were an act of war. They occurred because the Clinton and Bush administrations consciously chose not to adequately defend America.  “If the proper priority of U.S. action was to prevent the next attack, then the enemy was not just the particular group responsible for the 9/11 hijackings. It was the wider network of terrorists and their backers that might organize additional, large-scale strikes against the United States  no doubt inspired and energized by the “success of 9/11.” [p.6] In other words, how do we neoconservatives twist a specific act of war against the United States by a specific group so that we can address Israel’s security agenda  Iraq, Iran, Hezbollah, Syria etc.  even though that means we will not devote all U.S. resources to annihilating al-Qaeda, and American lives and treasure will be wasted fighting other peoples’ wars? The answer was of course to lie about Iraq’s culpability for 9/11 and the threat it posed to the United States, attack a main enemy of Israel, and leave the al-Qaeda threat to America largely intact.  “Wolfowitz warned against focusing narrowly on al-Qaeda and Afghanistan. The next 9/11, after all, could come from other organizations and places in the global terrorist map.” [p.49] Imagine this argument in a different context: In a cabinet meeting just hours after Pearl Harbor, the Undersecretary of War warned President Roosevelt against Washington too narrowly focusing on Imperial Japan when responding to the events of 7 December 1941. He urged that considerable resources be diverted from war against Japan to make sure no strikes against America came from Brazil, Siam, or another unexpected quarter, perhaps Paraguay. [and even] raised the idea of deferring military strikes in Afghanistan.” [pp. 66, 82-83] The plain fact is that the Department of Defense  five-plus years after al-Qaeda declared war  was caught without any plans to defend America against al-Qaeda, or any plans to reach out and squash the group before it could disperse. Feith’s attempt to divert Americans from this reality also is an effort to deny that those fellows in the blackest black hats  the CIA field officers  had hit the ground in Afghanistan long before any U.S. military units; had lined up the Afghan allies and military facilities that helped win the battle of the Afghan cities; and had the coffee brewing when, at long last, the Pentagon put in place enough search-and-rescue capability to commit U.S. troops.  “When Rumsfeld, Wolfowitz, or I used the phrase end the occupation,’ [L. Paul] Bremer would reply that many Iraqis would still say they were under occupation so long as large numbers of U.S. troops were in their country. He had a point, but we thought it mattered whether the Iraqi government was run by Americans or Iraqis. There was a difference between occupation as an accusation and occupation as a legal fact.” [p.463] Apparently Feith has never experienced foreign military occupation; perhaps he should spend a year living in the West Bank. The irrelevant, academic hair-splitting Feith does in the paragraph above is emblematic of the vast failure of common sense that was endemic in Rumsfeld’s team and the White House. Not once in his book does Feith  or any other members of Neocon, Inc.,  make an effort to assess the overwhelmingly negative impact the U.S.-led invasion and occupation of Iraq has had on the Muslim world’s perception of Washington’s intentions toward Islam. Indeed, there is no indication in the book that anyone in the Bush administration  save for those traitorous black hats at State and CIA  even for a moment considered that the invasion of Iraq would have an impact beyond Iraq. Feith claims that some worst case scenarios were sketched out in memos, but nowhere is there any evidence to suggest that he or any other U.S. leader made an attempt to explain why the United States would be immune to the disasters that befell Britain in Iraq and the USSR, Britain, and Alexander the Great in Afghanistan. In the end, it was not immune in either place, and that lack of immunity was entirely predictable. Feith now holds a professorship at Georgetown University; given the mediocre brainpower exposed during his stint in government and in writing this book, it is a good thing he teaches because he probably could not gain admission there as a student. .” [p.48] If it was a common assumption, it was a stupid one. Saddam Hussein was the single most important ally of the United States against al-Qaeda and its allies, and he was the best kind of ally because he did what America needed done without our having to coax, pay, or coerce him to do so. As long as Saddam was in power, the jihadis were stuck in place in South Asia and they were not coming west to permanent bases because the Iraqi intelligence and military services lethally greeted them on arrival. Saddam surely supported Palestinian terrorists, but so what; they attacked Israel not the United States. For America, Saddam was the cork in the neck of the bottle that kept the Sunni Islamists penned-up. Feith and his neocon sidekicks pull the cork from the bottle and now the jihadis have moved 2,500km west to more seriously threaten the Arab Peninsula, the Levant, Europe and Israel. In this regard, there seems to be a newly emerging iron law of history; to wit; everything the Neocons do in the name of helping Israel  such as hyping the threat from state sponsors of terrorism, invading Iraq, and urging war with Iran  digs Israel’s grave a bit faster and a bit deeper. There is more than a bit of poetic justice in that. Throughout Decision and War, Feith states in varying formulations that “no dereliction of statesmanship is as unpardonable as a failure to protect the nation’s security.” [p. 524] He is absolutely correct in this, but he is totally blind to the fact that through his efforts and those of Rumsfeld’s team and the Bush administration, U.S. national security is much weaker in 2008 than it was on 9/11. And so is Israel’s.